Is Hubble Contacts in Canada A Good Deal? Hubble Contacts seems to be exploding in popularity. So much so that it is now expanding into different countries. Now, Hubble Contacts is in Canada, but is it a good deal for Canadians? For anyone who hasn’t heard, Hubble Contacts is a company that offers daily contact lens subscriptions. 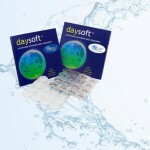 Every month, they ship you 2 new boxes of their daily contact lenses for a monthly fee. They don’t make their own contact lenses but instead source them from the contact lens factory St. Shine Optical Co., Ltd in Taiwan. Their lenses are for spherical prescriptions only (not for astigmatism), they come in a base curve (B.C) of 8.6 and a diameter (DIA) of 14.2. Their prescription range is from -0.50 to -12.00 (for nearsighted people only). They have been called a ‘direct-to-consumer’ contact lens brand, but I don’t see where that claim comes from. Hubble Contacts is the middle man between you and St. Shine Optical Co., Ltd who make the lenses. This is no different than if you were to order say, Acuvue Oasys from Lens.com, Lens.com would be the middle man between you and Johnson & Johnson (the makers of Acuvue Oasys). In my opinion, a true direct-to-consumer contact lens brand would manufacture their own lenses and ship them directly to you without any middlemen. Under this direct-to-consumer definition, I only know of one company that actually meets the criteria, and that is DaySoft. 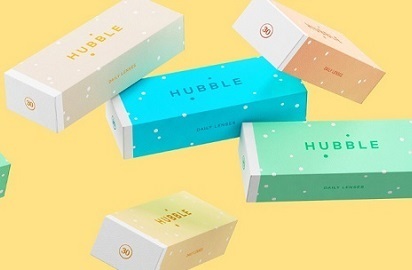 Since its inception, Hubble Contacts has claimed to be a high-quality, low-cost alternative to other mainstream contact lens brands. I have already written two articles (Are Hubble Contact Lenses Really ‘Half The Price’? & Are Hubble Contact Lenses Really That Cheap?) 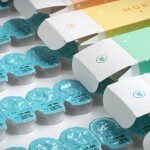 that show that Hubble Contacts is actually about mid-ranged when it comes to prices for daily disposable contact lenses. There are numerous brands that I much less expensive than Hubble, and several brands that are more expensive as well. $40 instead of $30 eh? Let’s look a little deeper into this. This means that $30 USD is $37.19 CAD. Of course, as everybody knows, the USD CAD exchange rate changes all the time, but presumably, the prices set by Hubble Contacts are fixed (i.e., they don’t change every to reflect the latest exchange rate). Who gets the better deal as the USD CAD exchange rate changes? For Americans and Canadians to pay the same price when corrected for the exchange rate, the Canadian Dollar would have to be worth exactly 3/4 (0.75) of the U.S Dollar. Or, if you’re more familiar with the USD to CAD rate, the U.S Dollar would have to be worth 4/3 (1.333) of the Canadian Dollar. If the Canadian Dollar is worth less than 0.75 of the U.S Dollar, Canadians are paying comparatively less than Americans. If the Canadian Dollar is worth more than 0.75 of the U.S Dollar, Canadians are paying comparatively more than Americans. The question is then, how often is the Canadian Dollar 0.75 or lower? 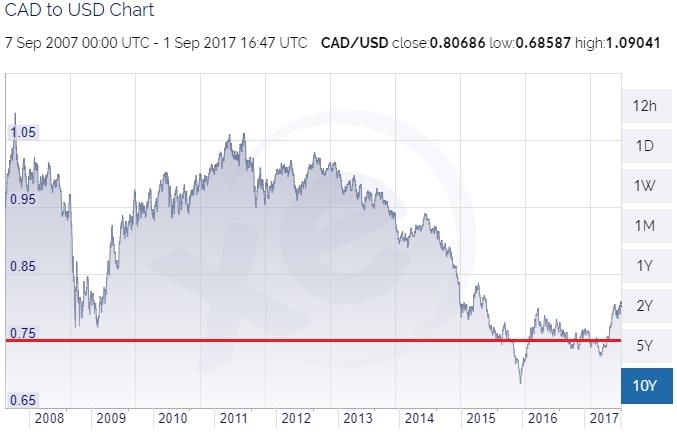 Over the past 10 years, the Canadian Dollar has only dipped below 0.75 of U.S Dollar for a total of approximately 7 months. The average is typically in the 0.80 – 0.90 range. Today the exchange rate is 0.81. That means that you are paying $32.27 USD for something that is worth $30 USD. In other words, you are overpaying by $2.27 USD for that month. The next month, who knows? Let’s see what happens if the conversion rate increase to 0.85 and 0.90. $40 CAD x 0.85 = $34.00 USD ==> overpaying by $4 USD for that month. $40 CAD x 0.90 = $36.00 USD ==> overpaying by $6 USD for that month. If Hubble Contacts adjusts the price for Canadians as the conversion rate rises and falls, then the price would remain fair and equal to that which Americans pay. But everyone reading this know that isn’t going to happen. The price will remain fixed at $40 CAD regardless of the conversion rate. Will Hubble Contacts still be less expensive than purchasing contact lenses from your eye doctor? Most likely. But are they the best deal for contact lenses on the internet? Not by a long shot. 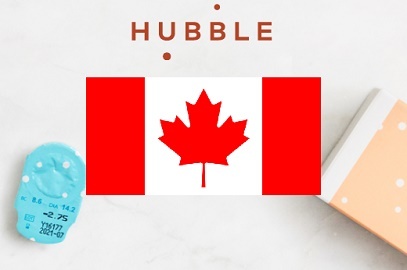 Considering that Hubble Contacts is made of a rather low-quality contact lens material, that there are many higher quality brands that are even less expensive than Hubble, and that Canadians are paying even more than Americans for it, I would say perhaps it’s not the best deal. 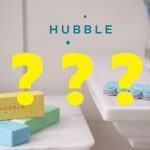 If price is not an issue for you and you decided to try Hubble Contacts, I would be very interested in reading about your experience with their lenses, so leave a comment below! hi my name is Brandy Joice I just received Hubble Contacts two week trial pair of contacts and they are already taking money out of my bank account I don’t want any more from them because I can’t wear them and I want my money back.